In English language cyberspace, there is a "totally looks like" meme. You've seen it: two different photos are compared because, well, they totally look like each other. Japan has a similar meme. As previously explained, in Japanese the meme is called "kanzen ni icchi" (完全に一致) or "complete match." Below, you can see a collection of complete match pics from Naver. Note that some of them might have Japanese celebrities you are unfamiliar with (or maybe you are! ), but the similarities should be universal. 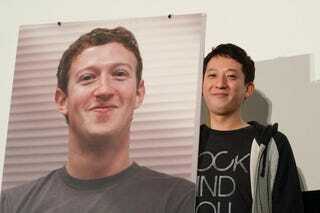 Courtesy of Techwave, the top photo is of comedian Shigeo Takahashi, who totally looks like Mark Zuckerberg. Complete match!